Contacts are ordered alphabetically, indexed with colored letter tiles. You can tap any one of those letter boxes and the screen shows you the entire alphabet highlighting the letters actually in use. You can tap a letter to jump to that part of the list. Much of the functionality available when viewing the list of all contacts is there when viewing a single contact too. Below the contact's photo and their latest SNS update, there are actions - "call mobile", "text mobile", "write on wall", "view website" and so on. Below each action, in smaller type are the target for the action (e.g. phone number, email, site URL) and where that info came from (Google, Facebook, etc.). The Nokia Lumia 520 offered loud and clear in-call sound and we had no issues with signal reception. The phone application shows you the call history, with shortcuts to voice mail, dialer and phonebook. The phone live tile will show the number of missed calls, as will the lock screen. We ran our traditional loudspeaker test and the Lumia 520 scored an Average mark. The loudspeaker isn't the loudest around but missed calls shouldn't be a problem. You can read more about how we test here. 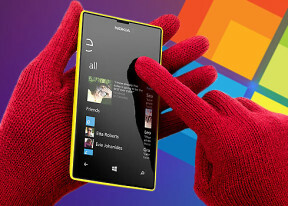 The Messaging hub on Windows Phone removes the old division between texts, IMs, social messages. The other hubs do the same for the other functionality, making the whole thing simple yet powerful. Individual emails can be marked as read/unread, flagged and unflagged, etc. Finally, you can search your entire mailbox for individual emails - it's a very useful feature, especially for those with large inboxes. The WP QWERTY keyboard is very comfortable to use and offers sound feedback. There's no vibration feedback and there's no way of enabling it.